New Rochelle, NY, April 11, 2018–A new study spanning 45 years has shown that while Alaska Natives have a similar incidence of thyroid cancer as the U.S. white population, their tumors at the time of diagnosis tend to be larger and to have spread beyond a localized area. The data, culled from the National Cancer Institute's Alaska Native Tumor Registry, are described in an article published in Thyroid, a peer-reviewed journal from Mary Ann Liebert, Inc., publishers and the official journal of the ATA. The article is available free on the Thyroid website until May 11, 2018. The article entitled "Occurrence of Endocrine and Thyroid Cancers among Alaska Native People, 1969-2013 " was coauthored by Sarah Nash, PhD MPH, Anne Lanier, MD, MPH, Alaska Native Tribal Health Consortium, Anchorage and Molly Southworth, MD, MPH, Alaska Native Medical Center, Anchorage. The researchers searched the registry to identify cases of endocrine cancer diagnosed over a 45-year period, focusing their comparison specifically on thyroid cancers, more than 85% of which were papillary tumors. "This is the first detailed examination of thyroid cancer in the Alaska Native population. Although further research is needed, the findings suggest that differences in access to healthcare may have contributed to the observed discrepancies with the white U.S. population," says Peter A. Kopp, MD, Editor-in-Chief of Thyroid and Professor of Medicine, Division of Endocrinology, Metabolism, and Molecular Medicine, Northwestern University Feinberg School of Medicine, Chicago, IL. "The similarity in outcomes suggests that the increase in the detection of small, typically indolent thyroid cancers observed nationally may be a result of improved detection methods, a phenomenon described as 'over-diagnosis' by some authors." Research reported in this publication was supported by the National Institutes of Health under Award Number HHSN26100005. The content is solely the responsibility of the authors and does not necessarily represent the official views of the National Institutes of Health. 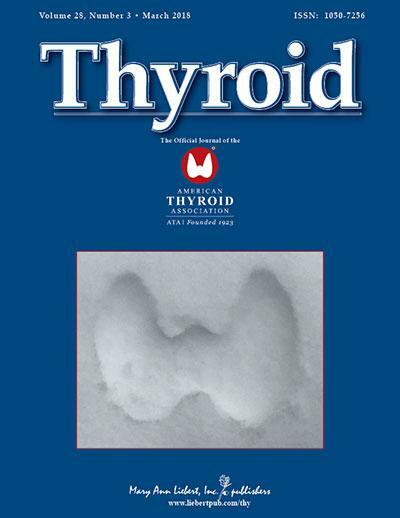 Thyroid, the official journal of the American Thyroid Association, is an authoritative peer-reviewed journal published monthly online with open access options and in print. The Journal publishes original articles and timely reviews that reflect the rapidly advancing changes in our understanding of thyroid physiology and pathology, from the molecular biology of the cell to clinical management of thyroid disorders. Complete tables of content and a sample issue may be viewed on the Thyroid website. The complete Thyroid Journal Program includes the highly valued abstract and commentary publication Clinical Thyroidology, led by Editor-in-Chief Jerome M. Hershman, MD and published monthly, and the groundbreaking videojournal companion VideoEndocrinology, led by Editor-in-Chief William B. Inabnet III, and published quarterly. Complete tables of content and sample issues may be viewed on the Thyroid website. The American Thyroid Association (ATA) is the leading worldwide organization dedicated to the advancement, understanding, prevention, diagnosis, and treatment of thyroid disorders and thyroid cancer. ATA is an international membership medical society with over 1,700 members from 43 countries around the world. Celebrating its 94th anniversary, the ATA delivers its mission — of being devoted to thyroid biology and to the prevention and treatment of thyroid disease through excellence in research, clinical care, education, and public health — through several key endeavors: the publication of highly regarded professional journals, Thyroid, Clinical Thyroidology, and VideoEndocrinology; annual scientific meetings; research grant programs for young investigators, biennial clinical and research symposia; support of online professional, public and patient educational programs; and the development of guidelines for clinical management of thyroid disease and thyroid cancer. The ATA promotes thyroid awareness and information through its online Clinical Thyroidology for the Public (distributed free of charge to over 11,000 patients and public subscribers) and extensive, authoritative explanations of thyroid disease and thyroid cancer in both English and Spanish. The ATA website serves as the clinical resource for patients and the public who look for reliable information on the Internet.